Piazzale Roma – the main Venice public bus terminal from where you can catch the public buses, the airport buses to Marco Polo Airport and Treviso Airport and taxis. There is also a car-park here. On Piazzale Roma, a sign directs people to the entrance of the People Mover station. The signposted entrance to the People Mover station is at the south-western corner of Piazzale Roma, next to the car parking station. On entering the building, you will see three ticket-vending machines on your left. Whether you’re going to the Marittima Cruise Terminal or all the way to Tronchetto, the fare is €1.50 (2016) for a single journey ticket. The machine accepts Euro coins or notes and credit cards. Once you’ve got your ticket, walk to the People Mover barrier gate. Hold your ticket under the scanner, barcode up, and the barrier door will open. A set of escalator takes you to the platform level of the People Mover. There is also a lift so wheel-chair bound travellers are able to ride the People Mover. At the People Mover platform, glass walls close off the train track from the platform where the train pulls in. An electronic indicator above the door tells you when the next train will be arriving. When the train arrives, the glass door on the far side opens to let passengers disembark, after which the door on the embarkation side opens to let passengers board. There were several people in our cabin with large cases and they all got off at the Marittima Cruise Terminal stop. (Note: There is a 5-minute walk from the People Mover station to the port.) The train then went on to Tronchetto for people headed for the carpark. From our experience, it appears that the Venice People Mover is pretty simple to use. Even if you’re not headed for the cruise terminal or the car park, a ride on the People Mover is enjoyable as it lets you see this section of Venice for the cost of €1.50 (2016) each way. At Tronchetto, we took the train back to Piazzale Roma. 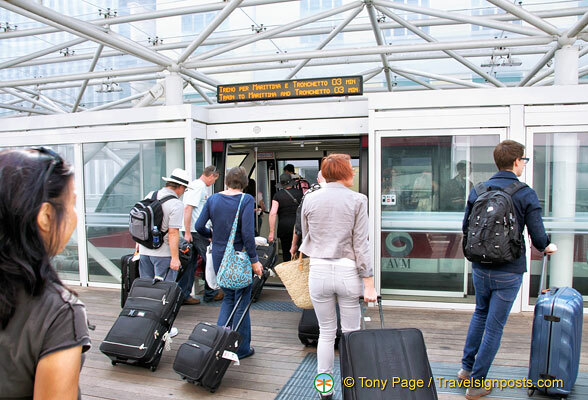 See more photos at Travelsignposts Venice People Mover album. Find out more about the Venice People Mover Here. Thanks for brilliant insight on how to get to our cruise ship from Piazalle Roma. You are the only source we found having arrived in Venice today to join our cruise ship tomorrow . No one explained how to do this as roads stop at Piazalle Roma and only pedestrian access with luggage is possible to and rom our Hotel Continental. No one mentions that licenced porters are available to take your luggage over the footbridges for a modest 10-15 Euro fee each way . Thank you for your feedback and we’re glad that we were able to help. Hope you have a great cruise and that you’ll visit our site again. Thanks for the information. My husband and I are planning to do a dry run in riding the people movers when we get to Venice the day before our cruise. Can we just stay on the train when we get to Tronchetto, the last stop to go back to Piazzalle Roma. There are two trains, one going in each direction, and they run every 10 minutes. The fare is now Euros 1.50 and it’s for a single journey. So if you’d like to ride back to Piazzale Roma from Tronchetto you’ll need to buy another ticket and have that validated. would anyone know how to get from the Cruise Terminal to Hotel Viktoria Palace?? I would appreciate some help. From the Cruise Terminal catch the People Mover to Piazzale Roma. From the Piazzale Roma vaporetta stop Lines 1, 5.1 and 5.2 will get you to the Lido.